Smart DNS helps set-top boxes get around regional restrictions. CactusVPN was started in 2011 by three friends who wanted a VPN service that had that “small business” feel. Seven years later the company is still going, offering both a VPN service and Smart DNS that helps get around regional restrictions on everything from PCs to living room set-top boxes. When you first start up CactusVPN on Windows, you’re greeted with a tabbed interface. After you sign in, you land on the Connection tab. This is where you connect to the server of your choice. It’s a very simple interface. 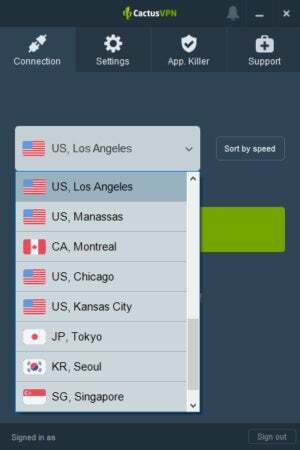 There’s a drop-down menu listing all the locations, and a small button allowing you to sort the list by speed based on your location. Then below that is a big green Connect button. CactusVPN running with an active connection. Once you’re connected there’s not much else to see. Since it has all that space it might be nice for the app to provide some information about how much bandwidth you’re using over the VPN, but right now it’s a mostly blank space. If there’s one thing I don’t like about CactusVPN on Windows 10 it’s that there’s no icon on the taskbar when the window is open. That is very annoying for the way I work. If you get distracted by something else on your desktop before connecting you have to alt-tab to get back to the VPN or click on it from the system tray. I asked the company about this and CEO Sergiu Candja said, “Our app is not something that people interact with on a regular basis...we see our app [as one] that works continuously (like the firewall does for example) but it doesn’t have to be permanently visible on taskbar and distract your attention.” For those who, like me, want it on the taskbar, you can drag the icon to sit on the system tray next to the system time, but that’s not quite the same as a full taskbar icon. 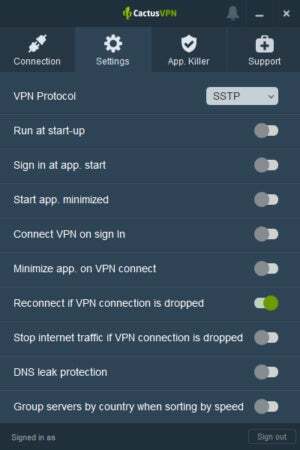 CactusVPN’s next tab is Settings with a variety of options you can tweak. The only options that are set by default are the VPN Protocol (without which you couldn’t connect) and the option to reconnect automatically if the VPN connection drops. On Windows, CactusVPN uses SSTP as the default protocol but also offers OpenVPN, IKEv2, L2TP, and PPTP. Beyond those initial settings, you can choose whether you want CactusVPN to run at startup, whether you want CactusVPN to automatically sign in when the app starts, start the app minimized, connect as soon as you sign in, enable the Internet kill switch, enable DNS leak protection, and automatically group servers in the drop-down by speed. On the third tab there’s also an app-killer feature. 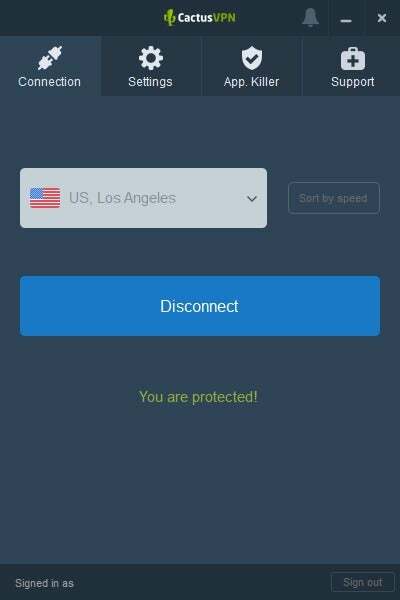 This lets you block specific applications when the VPN connection drops. This can be anything you want such as a torrent program, a specific browser, an email program, anything you want really. This is something of an entry-level power user feature as you’ll have to root around in your program files to specify the EXE you want killed when the connection drops. The final tab is the Support section where you can submit a trouble ticket, get links to your online account dashboard, and save your logs for troubleshooting. CactusVPN has a variety of pricing tiers. The best option is the VPN + Smart DNS tier that costs $55 per year for full access to all 23 VPN servers with unlimited bandwidth, the ability to use P2P file sharing, and the Smart DNS service. If all you need is a VPN, CactusVPN offers U.S. or UK plans. Both cost $39 per year and give you access to four VPN servers in the country of your choice with unlimited bandwidth. These lower-tier plans do not allow you to use P2P. CactusVPN’s score comparing the speeds in five different locations around the world was brought down by poor scores in Japan and Germany. Overall, Cactus VPN kept about 21 percent of the base speed. The speeds in the UK and U.S,, however, were particularly standout, both around 33Mbps compared to a base speed of 90.55Mbps on the day of testing. If all you’re interested in is a UK or U.S. connection, then CactusVPN will serve you well. CactusVPN’s CEO is Sergiu Candja, and the CTO is Pavel Bodeanu. The company lists its key staff members on its website. The company doesn’t list its business addreess on the site, but the company’s official headquarters are in Montreal, Quebec, Canada; however, the core technical team is based in Moldova. When you sign up for CactusVPN it asks for your country location and your email. For payments, you can use PayPal, credit cards, Alipay, and other international services via PayPro, or you can use CoinGate to pay via a variety of cryptocurrencies such as Bitcoin, Litecoin, and Ethereum. CactusVPN’s terms of service specify what kind of information the company collects based on your payment method. With PayPal, PayPro, and Coingate payments, for example, CactusVPN collects your email address, country, and your province—if you’re in Canada.